Many log homes take advantage of tall cathedral ceilings by installing ceiling fans and lights. The challenge is when the bulbs need changing! We located these gorgeous rubbed bronze Interceptor LED ceiling fans by Casa Vieja at LampsPlus.com for good looks and energy efficiency both inside and out. They’re rated for damp locations so, lakeside or down south, these ceiling fans can keep you cool! 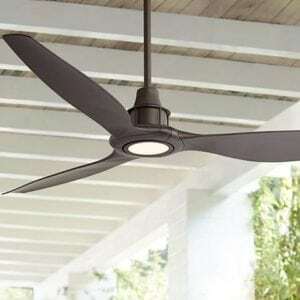 The Interceptor LED ceiling fan features gently curved 58” blade span and minimalist LED light in the center. The fan offers five speeds and a dimmer controlled by a hand-held remote control. The Interceptor is ideal for tall cathedral ceilings with optional down rod lengths in 12-, 18-, 24-, 36-, 48- and 72-inches with a maximum 18-degree slope using the included canopy cover. And with an LED light fixture, you’ll limit your ladder time with these long-lasting bulbs. The super quiet DC motor will keep pleasant breezes moving silently.